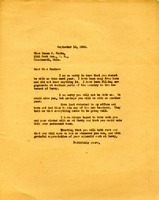 Letter talks about not being able to visit Mohonk this year but she couldn't get away that summer. 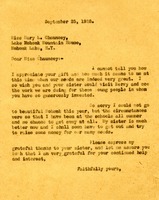 The letter expresses appreciation for a gift and invites Miss Chauncey for a visit. 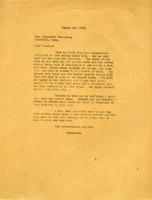 Martha Berry expresses her sympathy to Mrs. Carnegie about the recent death of their friend Estelle Whitfield. 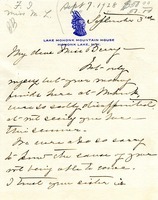 Marth writes to Mrs. Bonneyman to give an update about Bess, who is still running a fever and dealing with broken ribs and collar bone. Martha asks that every member of the family will write a letter so that Bess receives them by her birthday. 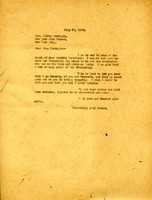 Martha writes to Susan to express how sorry she is that she cannot be at Berry next year, and hopes that Susan will be able to another year.